Far away in the semi-darkness of a perpetual dusk, there is a frigid domain in our Solar System's outer fringes where our Sun can shine with only a frail, faint fire. Here, in this region of icy, dancing bodies, there resides a little world with a big heart. The dwarf planet Pluto, a denizen of the Kuiper Belt--the home of a swarming sea of frozen comet nuclei--has, ever since its discovery, captured the imagination and affection of humanity. Perhaps this is because it is so remote from Earth and the golden, melting heat of our brilliant Star. On July 14, 2015, NASA's New Horizons spacecraft, at last, reached this strange world, circled by an extraordinary quintet of moons, and began to uncover some of the very well-kept secrets of this icy world. In November 2016, planetary scientists announced that their new research reveals fascinating clues about Pluto, indicating that this frozen sphere at the outer limits of our Solar System is much more active than anyone had ever imagined--and may harbor a subsurface ocean beneath its secretive big heart. Pluto's heart holds clues about an underwater ocean on the dwarf planet. Credit: NASA/JHUAPL/SwRI. Indeed, the presence of a liquid ocean situated deep beneath Pluto's frozen, icy surface is the best explanation for certain mysterious features unveiled by New Horizons, according to two new studies. The possibility that Pluto contains a subsurface ocean is not a new idea, but this research provides the most detailed investigation offered yet of its possible starring role in the evolution of certain important and unexplained features on Pluto--such as its low-lying, vast plain named Sputnik Planitia (Sputnik Planum). Sputnik Planitia is a 1,000-kilometer-wide basin located within a big heart-shaped feature observed on Pluto's surface, and the new research suggests that it could be in its current location because accumulation of ice made the ice dwarf planet that is Pluto roll over, thus forming cracks and tensions in the crust that suggest the possible presence of a liquid subsurface ocean. Sputnik Planitia, which forms one side of Pluto's famous big heart-shaped feature observed in the first New Horizons images, is mysteriously well-aligned with Pluto's tidal axis. The probability that this is a mere chance occurrence is only about 5%. Hence, the alignment indicates that extra mass in that particular location interacted with tidal forces between Pluto and its largest moon Charon to reorient Pluto. This reorientation placed Sputnik Planitia directly opposite the side facing Charon. However, a deep basin seems unlikely to provide the additional mass necessary to result in that particular kind of reorientation. "It's a big, elliptical hole in the ground, so the extra weight must be hiding somewhere beneath the surface. And an ocean is a natural way to get that," commented Dr. Francis Nimmo on November 16, 2016, University of California, Santa Cruz Press Release. Dr. Nimmo is a professor of Earth and Planetary Sciences at UC Santa Cruz and first author of a paper on the new findings published in the November 16, 2016 issue of the journal Nature. A second paper, appearing in the same issue of Nature, led by Mr. James Keane at the University of Arizona in Tucson, also proposes that this reorientation occurred and points to fractures on Pluto as evidence that this happened. Where Pluto resides in our Solar System's deep freeze, our Sun appears in its murky sky as if it were just an especially large Star floating around in a strange sea of starlight. Mystery tickles the imagination, and Pluto has been an intriguing mystery for almost a century. Situated as it is, far from our Sun, Pluto remained unexplored until the New Horizons spacecraft successfully accomplished its historic closest approach to Pluto, at about 7,750 miles above its secretive surface--about the same distance that it is from Mumbai, India to New York City--making it the first space mission to finally explore this brave new world so far from Earth. Pluto, Charon, and the other four relatively small moons belonging to the Pluto system reside in the frigid Kuiper Belt--a dimly lit and distant domain beyond the beautiful dark blue ice giant planet Neptune, the outermost of the eight major planets orbiting our Sun. In this previously unknown and unexplored region of our Solar System, a dazzling and icy host of tiny worldlets do a mesmerizing ballet around our distant Star. Pluto is a relatively large denizen of the Kuiper Belt, and it was originally classified as the ninth major planet from our Sun soon after its discovery in 1930. However, a better understanding of the true nature of the Kuiper Belt, and its heavy population of icy inhabitants forced astronomers to come to the realization that Pluto--a beloved, frozen, small "oddball"--is only one of the at least several large denizens of the Kuiper Belt. This realization prompted the International Astronomical Union (IAU) to formally define the term "planet" in 2006--and, as a result, poor Pluto was unceremoniously booted out of the pantheon of major planets, and re-classified as a mere dwarf planet--specifically, an ice dwarf due to its frozen nature. Nevertheless, Pluto still remains a small world of mystery and affection--and debate, since its re-classification as an ice dwarf is not universally accepted among astronomers. The Pluto saga began when a young farmer's son from Kansas, the astronomer Clyde Tombaugh (1906-1997) had bestowed upon him the difficult task of hunting for the elusive and possibly non-existent Planet X. According to theory, Planet X is an elusive giant planet that keeps itself well-hidden from the prying eyes of curious astronomers, where it lurks in the cold twilight zone of our Solar System's outer limits. Tombaugh, who used a telescope in Flagstaff, Arizona, did indeed discover a faint tiny pinpoint of light. However, in one of the many instances of scientific serendipity, Tombaugh did not find what he was looking for. He found something else. What Tombaugh found was not Planet X--it was the little world now known as Pluto! 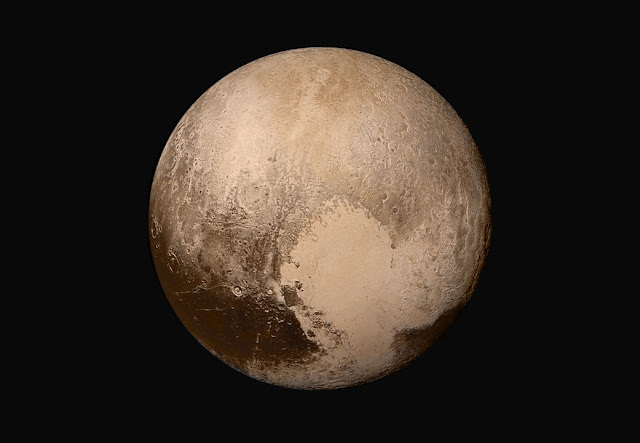 Like the other Kuiper Belt Objects (KBOs), Pluto is primarily made up of ice and rock. A small world, sporting only about 1/6 the mass of Earth's Moon and about 1/3 its volume, Pluto displays a highly inclined and eccentric orbit that takes it from 30 to 49 astronomical units (AU) from our Sun. One AU is equivalent to the average distance between our Earth and the Sun, which amounts to about 93,000,000 miles. Pluto periodically wanders inward towards our Star at a closer distance than Neptune. However, luck prevails, and an orbital resonance with Neptune prevents the two worlds from blasting into each other with catastrophic results. The ice dwarf Pluto was named for the Roman god of the underworld. Pluto's largest moon, Charon, was discovered in 1978 by the American astronomer James Christy. Some astronomers have suggested that Charon is really an enormous chunk of Pluto. According to this theory, Charon was once a part of Pluto that had been blasted off as a result of a violent collision between Pluto and some unidentified small world that was making a destructive rampage through the Kuiper Belt. The mess occurred when the doomed object met up with Pluto and crashed into it. Charon is the result of this ancient collision. During most of the 20th century, astronomers thought that Pluto was a solitary small world, situated in the frigid outer limits of our Solar System. However, in 1992, the very first KBO (other than Pluto and Charon) was spotted, and astronomers came to the realization that Pluto is far from alone. The realization that Pluto is just another constituent of the madding crowd of icy KBOs, resulted in its removal from the pantheon of major planets, and its reclassification as an ice dwarf. Launched on January 19, 2006, New Horizons successfully completed a five-month-long reconnaissance flyby of the Pluto system and is now en route to our Solar System's frozen fringes in order to study more distant small worlds inhabiting the Kuiper Belt, as part of its extended mission. New Horizons will help shed new light on the mysterious and very remote worldlets lingering in our Solar System's deep freeze. The Kuiper Belt is actually a lingering relic of our Solar System's ancient birth, and the population of frozen objects residing there has preserved in their frozen hearts some very important long-lost secrets of its past. New Horizons promises to uncover the amazing story about the origins of our Sun and its family of objects. Like other large basins in our Solar System, Sputnik Planitia likely formed as the result of a catastrophic impact by a large crashing meteorite, which would have blasted away an enormous amount of Pluto's icy crust. If a subsurface ocean had been present, this would result in an upwelling of water pushing up against the weak, thin, and fragile shell of crustal ice. Because water is denser than ice, at equilibrium, that would still leave a rather deep basin with a slender crust of ice covering the upwelled mass of water. "At that point, there is no extra mass at Sputnik Planitia. What happens then is the ice shell gets cold and strong, and the basin fills with nitrogen ice. That nitrogen represents the excess mass," Dr. Nimmo explained in the November 16, 2016, UC Santa Cruz Press Release. Dr. Nimmo and his team also considered whether the extra mass could be provided by just a deep crater that is filled with nitrogen ice, in the absence of upwelling of a subsurface ocean. However, their calculations indicated that this particular scenario would demand an unrealistically deep layer of nitrogen--more than 25 miles thick! The astronomers found that a nitrogen layer approximately 4 miles thick blanketing a subsurface ocean provides sufficient mass to form a "positive gravity anomaly." "We tried to think of other ways to get a positive gravity anomaly, and none of them look as likely as a subsurface ocean," Dr. Nimmo continued to explain. Dr. Douglas Hamilton, who is of the University of Maryland in College Park, and a coauthor of the study, formulated the reorientation scenario, while Dr. Nimmo came up with the subsurface ocean hypothesis. The subsurface ocean hypothesis proposes a scenario that is similar to what occurred on Earth's Moon, where positive gravity anomalies have been precisely measured for several large impact basins. However, instead of a subsurface ocean, the dense mantle material buried beneath the lunar crust pushed up against the thin crust of the impact basins. Lava flows then gushed up and flooded the basins, thus providing the extra mass. Icy Pluto, however, experienced this sort of scenario with a different ingredient. Instead of lava, the basin on Pluto filled with frozen nitrogen. "There's plenty of nitrogen in Pluto's atmosphere, and either it preferentially freezes out in this low basin, or it freezes out in the high areas surrounding the basin and flows down as glaciers," Dr. Nimmo noted in the UC Santa Cruz Press Release. Indeed, the images obtained from New Horizons reveal what appear to be nitrogen glaciers flowing out of mountainous terrain surrounding Sputnik Planitia. In reference to a subsurface ocean, Dr. Nimmo added that he suspects it is composed mostly of water with some unidentified antifreeze added to the mixture--which would most likely be ammonia. The slow refreezing of the ocean would cause stress on the icy shell. This stress would cause fractures that are consistent with features seen in the New Horizons images. Pluto is not alone where it resides in the Kuiper Belt. There are other large kindred bodies dwelling in the Kuiper Belt that resemble Pluto both in size and density, and Dr. Nimmo noted that these other objects likely also contain subsurface oceans. "When we look at these other objects, they may be equally interesting, not just frozen snowballs," he added. In a second study also appearing in the November 17, 2016 issue of the journal Nature, Dr Isamu Matsuyama and his doctoral student Mr. James Keane, of the University of Arizona's Lunar and Planetary Laboratory cite evidence of frozen nitrogen pileup that threw all of Pluto out of kilter, in a process termed true polar wander. This has been compared to a spinning top with a wad of gum stuck to it. "There are two ways to change the spin of a planet. The first--and the one we're all most familiar with--is a change in the planet's obliquity, where the spin axis of the planet is reorienting with respect to the rest of the Solar System. The second way is through true polar wander, where the spin axis remains fixed with respect to the rest of the Solar System, but the planet reorients beneath it," Mr. Keane explained in a November 16, 2016, University of Arizona Press Release. Planets usually spin in a way that minimizes energy. This means that planets tend to reorient in order to move extra mass closer to the equator while moving any mass deficit closer to the pole. In order to visualize this, if a large volcano were to grow in San Francisco, our planet would reorient to move San Francisco to the Earth's equator. But, in order to visualize how polar wander works on Pluto, it first needs to be realized that unlike Earth, whose spin axis is only slightly tilted so that the regions around the equator are gifted with most of the sunlight, Pluto is more like a "spinning top that is lying on its side." This means that the dwarf planet's poles receive most of the sunlight. Depending on the season, it is either one or the other. Furthermore, Pluto's equatorial regions remain extremely frigid all the time. Pluto is almost 40 times farther from our Star than Earth. This means that it takes the distant icy little world 248 Earth-years to complete one Pluto-year. At Pluto's lower latitudes close to its equator, temperatures are bitterly cold at minus 400 degrees Fahrenheit. At this almost unimaginably frigid temperature, nitrogen turns into a frozen solid. Nitrogen and other exotic gases, over the span of a Pluto-year, condense on its dark side that is kept in perpetual shadow. Eventually, as Pluto circles around our Sun, our Star's melting heat causes the nitrogen and other substances to become gaseous again and re-condense on the other side of the little world. This results in seasonal "snowfall" on Sputnik Planitia. "Each time Pluto goes around the Sun, a bit of nitrogen accumulates in the heart. And once enough ice has piled up, maybe a hundred meters thick, it starts to overwhelm the planet's shape, which dictates the planet's orientation. And if you have an excess of mass in one spot on the planet, it wants to go to the equator. Eventually, over millions of years, it will drag the whole planet over," Mr. Keane said in the November 16, 2016, University of Arizona Press Release. "I think this idea of a whole planet being dragged around by the cycling of volatiles is not something many people had really thought about," Mr. Keane added. The two University of Arizona researches used observations made during New Horizons' flyby and combined them with supercomputer models that enabled them to take a surface feature such as Sputnik Planitia, shift it around on Pluto's surface and observe how it alters the ice dwarf's spin axis. As a result, in the computer models, the geographic location of Sputnik Planitia wound up intriguingly close to where one would expect it to be. If Sputnik Planitia were a large positive mass anomaly--possibly as a result of loading of nitrogen ice--it would migrate to Pluto's tidal axis with respect to Charon, as it approaches a minimum energy state. Therefore, the massive building up of ice would wind up where it would cause the least wobble in Pluto's spin axis. In addition, the supercomputer simulations and calculations predicted that the accumulation of frozen volatiles in Pluto's big heart would result in cracks and faults in the planet's surface in precisely the same locations where New Horizons spotted them. The presence of tectonic faults on Pluto suggest the existence of a subsurface ocean at some point in Pluto's history, Mr. Keane noted. He added that "Before New Horizons, people usually only thought of volatiles in terms of a thin frost veneer, a surface effect that might change the color, or affect local or regional geology. That the movement of volatiles and shifting ice around a planet could have a dramatic, planet-moving effect is not something anyone would have predicted." Judith E. Braffman-Miller is a writer and astronomer whose articles have been published since 1981 in various magazines, newspapers, and journals. Although she has written on a variety of topics, she especially loves writing about astronomy, because it gives her the opportunity to communicate to others the many wonders of her field. Her first book, "Wisps, Ashes, and Smoke," will be published soon.